February 1938, Photo Unit #: A281 American Artillery unit emplacement, Teruel front. Harry Randall photos, 11-0880, Tamiment Library. The fascists the meaning of Red. 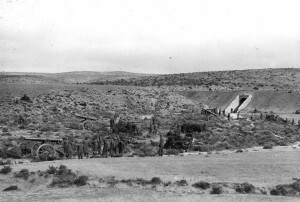 American Artillery unit emplacement, Teruel front. Harry Randall photos, 11-0881, Tamiment Library. American volunteers found the training at Almansa to be poorly organized and hampered by near-criminally ineffective Base leadership. 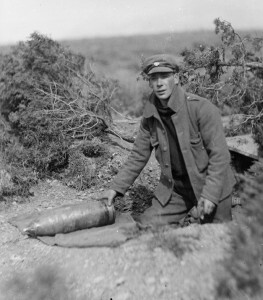 Major Paul Maurice, the Base Commander, a former officer in the French Army during WWI, placed fellow Frenchmen in key positions within the Batteries in training. The Base Commander limited the training regime to “close-order drill; instruction on military courtesy; and lecture on theoretical and strategic use of artillery.” The Base Commander was loathe to allow the Americans to utilize the two antiquated guns on site: an English 80mm and a French Schneider 75mm. The Americans trained clandestinely with the assistance of the Battery’s French commander, Lieutenant Maurice Tavlitsky. An English-speaking Frenchman of Polish-Jewish descent and a Reserve Artillery officer in the French Army. Tavlitsky was an opportune choice as he sympathized with the Americans desire to train. He placed Arthur Timpson in charge of the Americans. Timpson received formal artillery training while studying in the Soviet Union. To camouflage the Americans training and avoid censure from the base commander, Major Maurice, Tavlitsky “faked” his daily reports. The preferential treatment of Frenchmen extended to after-duty hours. While other nationalities were restricted to barracks at night, French volunteers received liberal evening passes into town. Guards enforced the barracks restriction and in one instance refused to release the men while the town was under air attack. This last incident eventually led to the Base Commander’s removal and arrest. The guns arrived without sighting instrumentation or firing tables. Timpson stated that it would “take a couple of thousand shots” to build an accurate table. The guns were produced before the introduction of recoil mechanism which further complicated firing accuracy. To compensate for the recoil, each gun was issued a set of wooden ramps that were placed behind the wheels. When the gun fired, its recoil rolled the gun up the ramp. After the momentum was spent the gun rolled back down the ramp allowing the crews to wrestle it back into firing position. 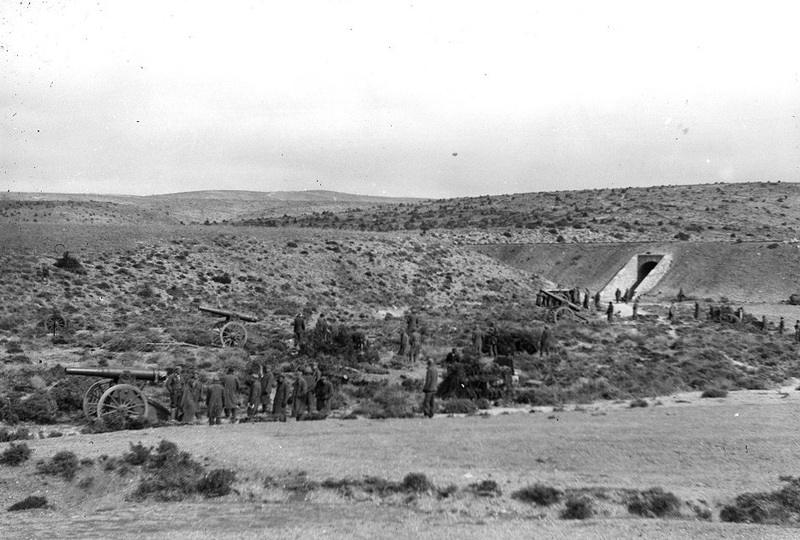 American Artillery unit emplacement, Teruel front. Harry Randall photos, 11-0882, Tamiment Library. Personnel spent endless hours perfecting the gun drill, repeatedly dry firing the guns. They aimed for a goal of firing one round every other minute. By October 1937, when the unit finally deployed, most of the men had received between five- and eight-months training which far exceeded the training most volunteers received. On the eve of deployment, the John Brown Battery’s command structure included: Timpson, Commander; Jack Karson (Carson), Commissar; and Jack Waters (Sam Wiederhorn), Adjutant Commander and Head of Headquarters Platoon. Battery personnel included gunners, topographers, scouts, communications specialists, medics, drivers, and cooks. The men assigned to these positions had varied backgrounds including some with prior artillery experience or specialist training serving alongside previously wounded veterans. In December 1937, the John Brown Battery consisted of 70 men: 49 Americans, 10 Canadians, 6 British, and one each from Finland, Hungary, Romania, Sweden, and Yugoslavia. 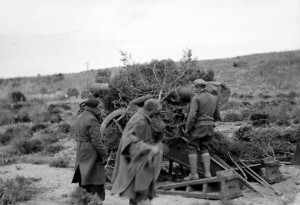 When the John Brown Battery finally deployed it was sent to Villanueva de la Serrana, on the Estremadura Front from October through December 1937 and then to the Toledo Front. 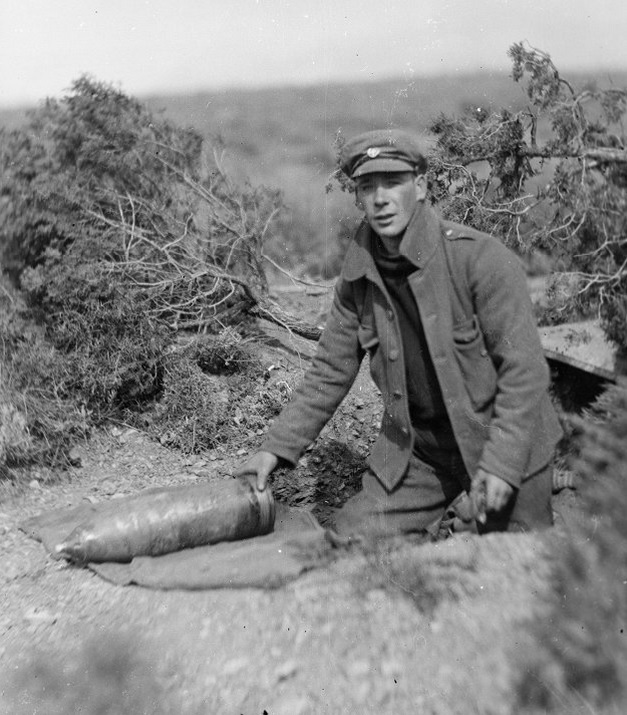 The Battery remained on the Toledo Front until the Internationals were repatriated. The John Brown’s mission was to provide support to the infantry holding the front lines outside the city of Toledo. The Toledo Front was quiet and the battery rarely fired. Nathan Budish, with Sid Kaufman as his Commissar, commanded the 35th Battery. Timpson nominated Budish, who trained with the John Brown Battery, to command the newly raised battery. Prior to volunteering in Spain, Budish served as an artillery officer in the US Army Reserve. The 35th Battery was actively engaged, serving at Teruel, and during the Retreats. At the end of the Retreats the battery turned over its remaining guns to a Spanish unit and moved to Alcoy near the Levant Front. After several weeks, the 35th Battery received new Czechoslovakian dual purpose anti-tank/anti-aircraft guns and was assigned to the 129th International Brigade. The 129th was the last International Brigade formed and saw heavy combat on the Levant Front. Americans were also assigned to other International Artillery, Anti-Tank and Anti-Aircraft units based on their language or technical skills. Other Americans were attached to units to replace casualties or to temporarily augment battery personnel. In December 1937, Americans could be found in the Thaelman, Gramsci, Anna Pauker, Grupo Eslavo Artillery and the Petko Militec Anti-Tank Battery. Later American volunteers served in the Gottwald and Dimitrov Anti-Aircraft batteries. Historical Commission, Songs of the John Brown Battery, Russian State Archive of Socio-Political History (RGASPI), Fond 545, Opis 2, Delo 163. John Brown Artillery Battery, Visit to Anglo-American Artillery Battery, In Training, Almansa, October 25 to 27 . (Hereafter: John Brown Visit); RGASPI Fond 545, Opis 3, Delo 472. The author of the piece is unidentified at present but is likely Sandor Voros who headed up the XV BDE Historical Commission. Voros briefly trained with the Anglo-American battery at Almansa and noted that he planned a visit to Almansa as part of his work to document the history of the American volunteers. A French Battery and a Spanish Battery were also undergoing training in Almansa in October 1937. Si Podolin, “John Brown’s Body, Etc.,” The Volunteer, v.8, n.1, April 1986, pp. 9, 20. John Brown Visit. Marshall Mikhail Tukhachevsky who was a successful commander during the Russian Civil War was the leading officer in the Soviet Army in the 1930s renowned as both forward looking and reform minded. He was one of the first officers arrested and executed by Stalin in the purges. He was executed in June 1937 after being convicted of treason. He was officially rehabilitated after Stalin’s death. John Brown Personnel list, RGASPI Fond 545, Opis 6, Delo 47; Domingo Gamiz y Cabrera is listed as Cuban, but was living in the US when he went to Spain and is factored into the American number. An additional personnel lists is in RGASPI Fond 545, Opis 6, Delo 40, dated December 31, 1937, there were fifty-three Americans at that time. Letter from Budish to Bill Lawrence, July 18, 1937, RGASPI Fond 545, Opis 6, Delo 869, requesting transfer from JB; Letter from Timpson to John Gates, RGASPI Fond 545, Opis 6, Delo 869; John Brown Visit, Jack Waters noted that Budish was not being properly utilized. RGASPI Fond 545, Opis 6, Delo 40. Historical Commission, Songs of the John Brown Battery, RGASPI Fond 545, Opis 2, Delo 163.